I've always loved Minoan art, ever since I visited Crete on holiday years ago, so I was very pleased to get a colouring book that is letting me enjoy the art of ancient Crete all over again. The Minoan Coloring Book is by Laura Perry, author of Ariadne's Thread: Awakening the Wonders of the Ancient Minoans in our Modern Lives, which I reviewed a few years ago and really like. The Minoan Colouring Book is independently published through CreateSpace, and the description given says: "Discover the amazing world of the Minoans of ancient Crete through this beautifully-drawn collection of images to color. 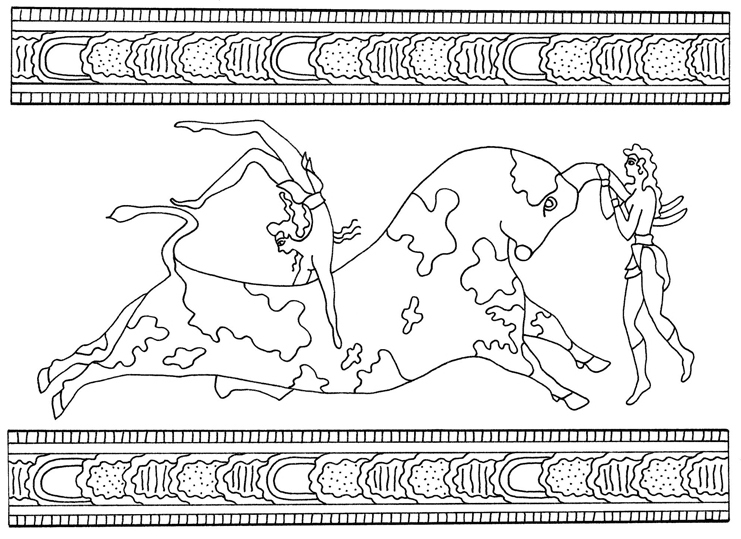 With 48 line drawings of bull leapers, snake goddesses, prancing dolphins and more, The Minoan Coloring Book will provide you with hours of relaxation and enjoyment." It is unusual, fascinating and well drawn. The pictures are quite easy to colour as well - which is good, because I'm not the most experienced artist. 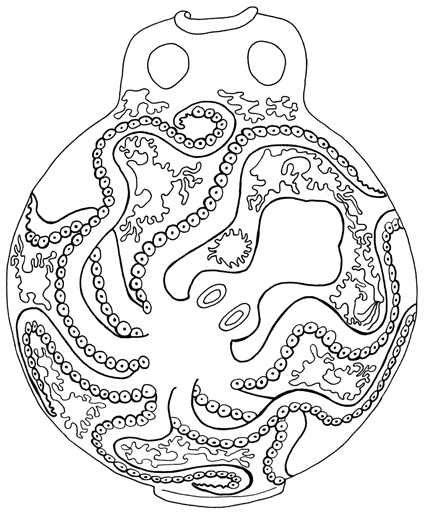 Laura says in her introduction to the Minoan Coloring Book: "Within these pages you’ll find snake goddesses, bull-leapers, princes and priestesses, dolphins and octopi. When I was trying to decide which bits of Minoan art to include in this book, I thought about which frescoes and other beautiful finds from ancient Crete mean the most to me, the ones that draw me right back to Minoan civilization when I see them. In other words, these are my favorites. I hope they’re yours, too. "This coloring book contains single-sided coloring pages. These images are not clip-part or pictures I’ve Photoshopped. These are all hand drawings I’ve made based on photographs of the frescoes, figurines, jewelry, pottery, and other artifacts from ancient Crete." You can see some of the pictures on this post. 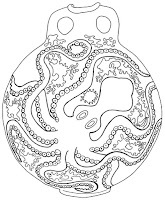 I haven't had a chance to start colouring them in yet, but I am tempted to start with that delightful octupus jar. There's one very much like it in the British Museum, which has often caught my eye as I have browsed the Minoan gallery in the past. I might dig out my photo of that and pop it on my blog tomorrow. 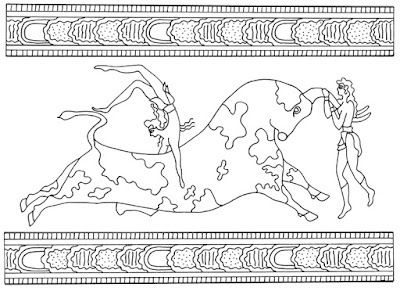 You can order The Minoan Coloring Book via Amazon.